A major international school is to widen its access to young children in the suburban areas by opening up its pre-school course this summer. 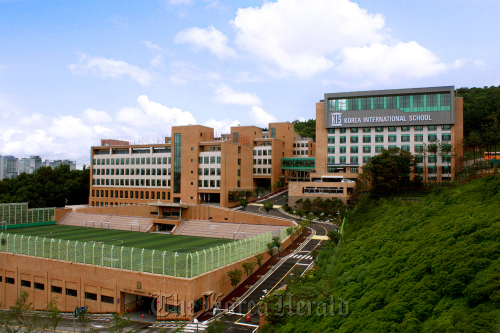 The Korea International School will open its preschool course for 3-year-old and 4-year-old children in its Pangyo campus on Aug. 11, according to officials. The KIS also earlier opened another pre-school course in Gaepo-dong, Seoul, which was the first full-time pre-school course offered to children in the age 3-4 group. Both Gaepo and Pangyo campuses are to be run under the same educational curriculum and students will be able to transfer freely from one to another. The KIS system is to be a unique one as the Seoul International School does not include pre-school age courses and the Seoul Foreigners’ School only runs half-day courses as part of their daycare program. “Because of the 30 percent quota of Korean students in international schools, the entrance competition is quite intense,” said a school official. There are presently 46 foreign schools here, according to the Seoul Metropolitan Office of Education. Most of them, especially more than 80 percent of the kindergartens and pre-schools, were located in the metropolitan area. “The KIS Pangyo pre-school course will thus be a unique opportunity of global education for young children in Gyeonggi Province,” said a school official. The 57,727 square meter KIS Pangyo campus is located 5-10 minutes from Bundang and 20 minutes from Gangnam. The pre-school course is open to 3 or 4-year-old children whose either parent is a foreign national or who has lived abroad for three years or more, said officials. The foreigner population here reached 1.2 million as of the end of June, according to the Justice Minstry. Among them, 30 percent are residing in Seoul and 29.3 percent in the surrounding Gyeonggi Province. Seongnam City, where the Pangyo new town is located, incorporates some 26,000 foreign nationals.